So, we moved out the Christmas tree. but I have a few favorites from 2 days ago when I had my family over. Now, it's time to get ready. Put on the dress, the makeup, the everything. If I was a millionaire I'd be buying presents for others all the time! Give me a million bucks and I'll prove you wrong! - one present for each day, from December 1st to December 24th. but I thought I'd share some of the items. or use some of the ideas as stocking stuffers. Check back in another couple of weeks when I reveal the rest of the list. but with a minimum of effort you can make your own decorations. No Christmas without hearts, right? And nothing is easier than to make than a few hearts. and then you make a handmade gift for that person and they make you one. I love making things and I love gifts! Naturally I had to sign up for the Christmas edition this year. by email, pinterest, blogs, you name it. it's a handmade gift with special thought behind it. and I'm so in love with the ornament she made me. but she nailed that one right on the head. And don't you want to be a part of it? and sign up for the next one in 6 months! Christmas | Baking so far..
Time for a Christmas-y post after yesterday's depressing rainbow-bruise post. 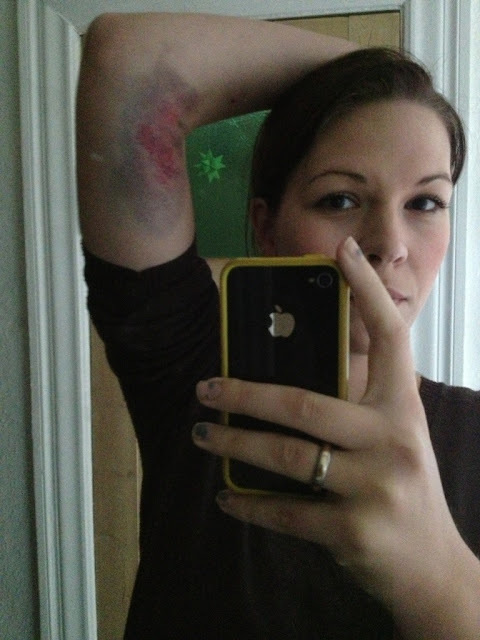 Although, I do want to give you an update on the rainbow-bruise. 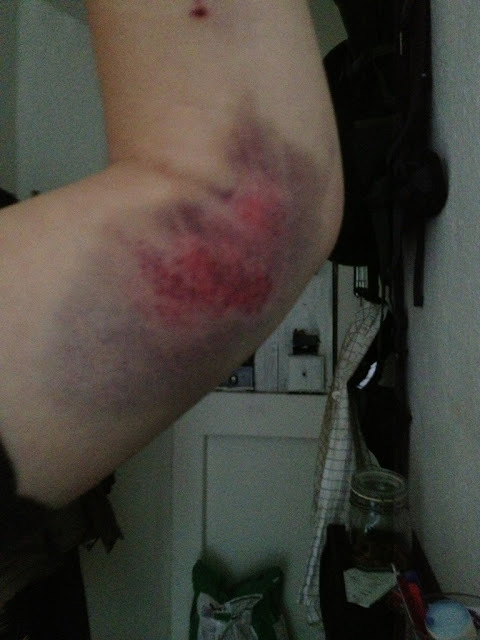 It's now not nearly as rainbow-y, just very black and blue. which sort of creeps me out. The thought of the blood continuing to seep through my arm's tissue. and then it might just suddenly give up and fall off. lovely, cheery pictures of cake! but this week has just been crazy and it's not letting up. Hopefully next week will have more opportunities for making Christmas goodies. WARNING: This post is NOT about Christmas, snow or cake. If you're squeamish, look away. I took an introductory archery class last night. It was a lot of fun, and I really want to go again. Well, it's kinda big actually. What is that rainbow colored madness going on on my arm, you ask? That would be a bruise. 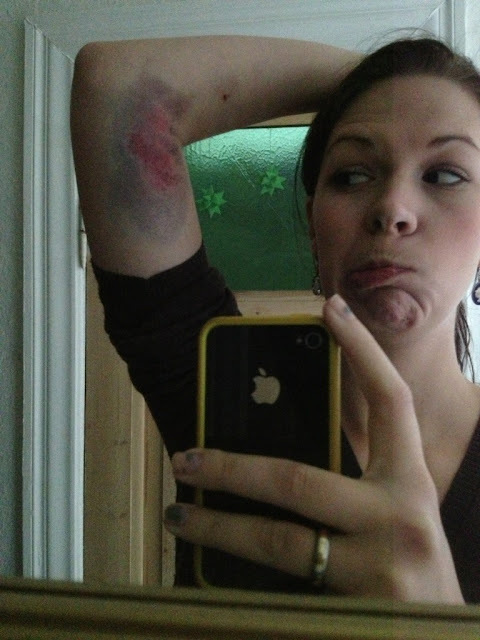 The largest and most painful bruise I have ever had. How did I get it you ask? I tried altering my arm, but it didn't work. All my good shots were immensely painful. I didn't whine at the class, though, it was too much fun. I mean, I knew it hurt, but still.. I wont be going back to the archery class. Not sure it's worth that much pain. It's a badass bruise, but it wont leave a scar. In a week you wont even know it ever happened! I like scars. Is that weird? Maybe I'll do a post on scars sometime. Olympic gold medal I've been eyeing. If I could I would be jumping with joy! Been on the couch all day. with a friend that came into town. from now on until january. Although that's not really too different from the rest of the year. And now, an abundance of Christmas decoration pictures! But the most important decoration? Can't wait to light the first candle tomorrow!